During the last three years (June 2014 to June 2017), Indian Space Research Organisation (ISRO) has successfully accomplished 41 missions, which includes 19 launch vehicle missions, 19 satellite missions and 3 technology demonstrator missions. (i) Operationalisation of GSLV-MkII with home-grown Cryogenic Upper Stage (CUS) with indigenous capability for launching 2-tonne class satellites. (ii) Successful launch of first developmental flight of GSLV-MkIII, which validated new version of Indigenous Cryogenic Engine. With this capability, it will be possible to launch upto 4-tonne class of communication satellites into Geosynchronous Transfer Orbits (GTO). (iii) Launch of 14 flights of PSLV, which includes launch of 104 Satellites in a single PSLV (PSLV-C37) mission – Maximum satellites launched in a single launch mission till date. (iv) Realisation of South Asia Satellite to enable South Asian countries to establish SATCOM based services such as Television/DTH, VSAT, e-governance, banking, tele-medicine & tele-education etc., with coverage over South Asia. (v) Realisation of 7-satellite NavIC (Navigation – Indian Constellation) to provide Position, Navigation and Timing Services, with five satellites launched during the last three years. 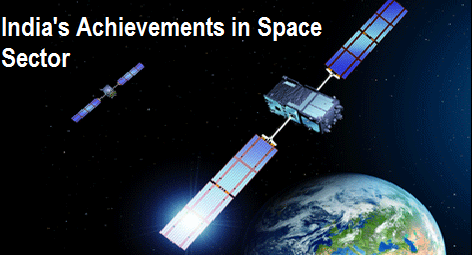 (vi) Augmentation of Satellite Communication capability with 7 more satellites viz. GSAT-6, GSAT-9, GSAT-15, GSAT-16, GSAT-17, GSAT-18 & GSAT-19. (vii) Successful Technology Demonstration missions viz. Crew Module Atmospheric Re-entry Experiment (CARE), Re-usable Launch Vehicle (RLV-TD) and Scramjet Air-breathing Engine. (viii) INSAT-3D & 3DR together are providing meteorological data every 15 minutes for enabling weather forecasting. Ocean surface wind vector data from SCATSAT-1 are being used operationally by global user community. (ix) Augmentation of earth observation capability with 4 satellites viz., 3 High Resolution Cartographic and 1 Resource monitoring satellites. (x) Placing a unique multi-wavelength observatory ‘Astrosat’ in orbit, carrying instruments realised through Indian academic institutes to enhance understanding of universe and astronomical phenomena. (xi) Mars Orbiter Mission (MOM) completed 1000 days in the orbit. Earlier, Mars Orbiter Spacecraft was successfully placed in Martian orbit on September 24, 2014 making India the first country to do so in its first attempt. (xii) Enabling host of applications using synergy of earth observation, communication and navigation satellites in governance and development. India has created a niche in the field of space science & technology viz. launch services, earth observation, communication & navigation and application of space technology for national development. Today, India stands one among the top six space faring nations in the world. The areas which are benefitted/ likely to be benefitted with the utilization of space technology and its applications include – resource monitoring, weather forecasting, telecommunication, broadcasting, rural connectivity, health & education, governance, disaster management support, location based services, space commerce including host of societal applications. The space science and planetary missions, viz. Mars Orbiter Mission and ASTROSAT renew the interest of young minds towards space science. My ISRO is the pride of this country.